From loose brush bristles to grill location, don't make these mistakes. It’s grilling season, and that’s good news for all of us. From charred sweet corn to juicy burgers and spiralized hot dogs, there’s so much to love about a cook-out. 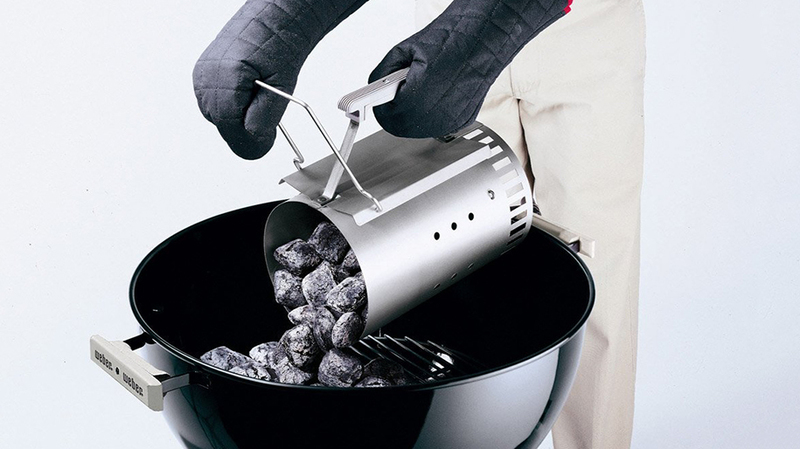 But for novice grillers and pros alike, there are a few safety precautions that are often overlooked. Forget burnt food; these scenarios can lead to dangerous fires and even hospital visits. Below, we’ve rounded up a few of our top grilling safety tips. Stay safe out there! Think bacteria’s only something you have to worry about if you’re handling raw meat? Think again. Even a batch of innocent-looking asparagus can get contaminated if not properly cooled before it makes its way to the grill. Bacteria can stay alive until the temperature reaches about 165 degrees F. Be sure to keep your food refrigerated until you’re completely ready to grill it, and if you’re planning on saving any for leftovers, wrap it up and get it back in the fridge. Food poisoning is no fun. We’ve seen too many stories in the news recently of people who end up in the emergency room after swallowing—yes, swallowing!—metal bristles from grill brushes. Instead, use brushes without bristles (there are plenty on the market). Alternatively, just ball up some aluminum foil and get to work using that to scrub your grill. Fire isn’t the only thing you need to worry about while grilling. Even though smoke is generally an accepted part of the whole experience, you’ll want to avoid inhaling too much of it. The stuff coming off your grill isn’t just from residual food debris; it likely also contains things like carbon monoxide and cancer-causing Polycyclic Aromatic Hydrocarbons (PAH). When possible, wear a mask—or just stay away from the grill during the times when you don’t need to be babysitting a piece of meat. Okay, so you might feel like the world’s dorkiest grill chef when you lug out the instruction manual. But if you’ve just purchased a new grill, it’s nearly a requirement. Each grill has a different set of rules and precautions, and no matter how many times you’ve grilled before, you’ll want to check to be sure that the new grill works similarly to your last one. Oh, and if you’ve lost the manual, try searching online—there’s likely a digital copy out there somewhere. Plopping down a grill right next to your garage might seem like a convenient and efficient idea, but it’s actually a seriously dangerous one. If a fire does break out, you’ll have a lot less luck shielding your home from the flames if it’s right next to the outbreak. Place the grill a good distance far away from any flammable items (yes, even trees and bushes! )—and consult the manual if you’re not sure how far is far enough. It’s almost a funny thought, right? But believe it or not, accidents happen all the time simply because people indulge in a few too many beers before they hit the grill..and the aftermath of such a scenario is certainly far from funny. You can always have that extra pale ale as soon as dinner’s done cooking. In the meantime, stay alert. Ready to grill? Get our best recipes here.